Dr Danial fields questions from reporters. KUCHING: Kuching recorded a total of 1,529 cases of animal bites, or 15 cases a day this year alone. 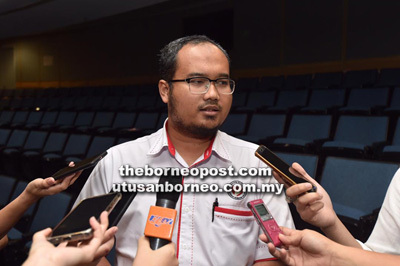 This was revealed by Dr Muhamad Danial Salim from Kuching Division Health office, following a rabies awareness briefing at MBKS Auditorium here yesterday, where he briefed about rabies and its impact on human health. “However, this is only the number of reported bite cases. It is not the number of human rabies-positive cases,” he told reporters. Dr Danial said to prevent getting infected by the rabies virus, people should avoid getting bitten, scratched or licked by animals such as dogs and cats. He said it is important to get the message across to people, as most think that the virus is passed on from animals to humans through bites only. “People do not just get infected from bites by rabid animals. wounds on the area that is scratched or licked. “So it is best to avoid (such contact) with dogs and cats,” he said. However, if someone has been bitten, it is necessary to take immediate action, said Dr Danial. “If a person is bitten by an animal, it is very important to wash the wound with soap under running water for 15 minutes. After that, they must go to the nearest clinic or hospital for treatment. “Only at the clinic or hospital will it be determined whether the victim needs vaccination and further observation,” he said. He also urged pet owners to be responsible by vaccinating, neutering/spaying their animals and not allowing them to roam freely outside as that would expose them to higher risk of being bitten and getting infected by rabid animals. The briefing was attended by several community leaders, and was organised by State Veterinary Services Department, Information Department and Health Department. Other speakers included veterinary officer Dr Nicholas Jenek and the police Community Crime Prevention and Safety section head DSP Ang Seow Aun.